Since 2007, the 35 Comfort Shawl and Baby Cap Ministry members knitted and sent over 900 shawls and lap blankets to people who are grieving; who have had chemo, surgery, or other serious illnesses; or who just need comfort. The group also knitted over 1,800 baby caps since August, 2008. The baby caps were sent to a maternity clinic and birthing center in Haiti and to Presbyterian mission hospitals around the world through Church World Service and Project Cure. 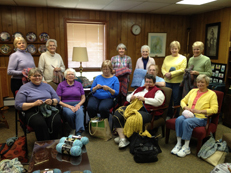 from 1:00 p.m. - 2:30 p.m. Join us for laughter, chatter, knitting and crocheting! Don't know how to knit or crochet. We'll show you how. Yarn provided. For more information, contact Valerie Rabian. 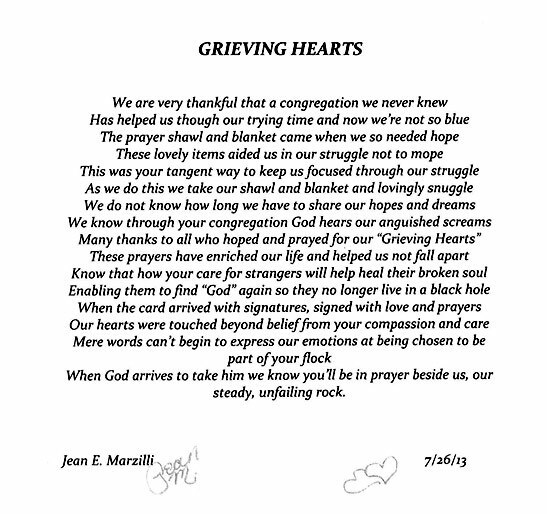 This beautiful Grieving Hearts poem by poet Jean E. Marzilli is representative of the hundreds of thank you notes we have received from all over the world.